As we finish with Esther – and prepare to begin the book of Job (coincidentally the most misunderstood book in the Bible) – let’s pause for a moment and recap a bit. Thus far, as we have read from Genesis to Esther, we have learned much about God and His character. We have seen that He is holy and requires holiness in His Presence. As well, we have learned that He is just and kind and gentle and full of mercy… giving second, third, continuous chances to those whom He loves. We have seen His faithfulness to Abraham – even down to future countless generations, and have seen His loyalty to a people who seem to reject Him at every turn. God has taken the form of a doting Father, all the way to a jilted Lover… yet we have been amazed at how many times He keeps coming back – willing to forgive and wipe the slate clean. We have watched Him rescue a people – HIS people – time and time again, despite the fact that He knows they will undoubtedly turn their back on Him the first chance they get. That is the God we have been introduced to thus far. But, along with this portrait of our God, and mixed in to the history of a group of people called the Israelites… there has been another thread woven within the fibers of every book… that thread is Jesus. 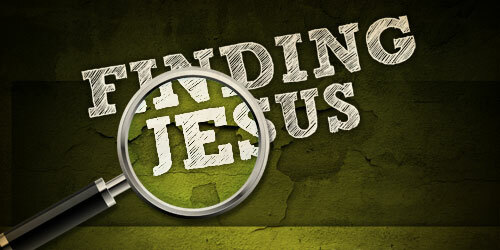 He is there – in every turn… as long as you know where to find Him. We will find out in the NT that Jesus has been in existence from the beginning (He didn’t just come about on the first Christmas morning!). If you take time to look you can find Him all throughout the Hebrew Bible. In Genesis – He is The Seed of the Woman. Predicted futuristically the He will crush the head of Satan with His heel on the cross. (Gen 3:15). In Exodus – He is The Passover Lamb – whose shed blood cleanses from sin. (Ex 12:12-13; John 1:29). In Numbers He is the Pillar of smoke by day, fire by night – leading us through the desert and into the Promised Land. (Num 9:17). In Deuteronomy He is A Prophet liken unto Moses – who leads God’s people out of slavery and into freedom! (Deut 18:15; Acts 7). In Joshua He is The Captain of my Salvation – who leads us in victory over our enemies. (Jos 5:14; Heb 2:10). In Judges He is My Judge and Law Giver – who is able to save and to destroy. (James 4:12). In Ruth He is My Kinsman Redeemer – who lifted me from destitution and poverty – and took me as His own. (Ruth 4:14; Col 1:13-14). In 1-2 Samuel He is the Trusted Prophet – who came speaking exactly what the Father told Him to speak. (1 Sam 9:9; Matt 21:11). In Kings – Chronicles He is the Reigning King – but unlike many of the prototypes, Jesus was a fair and just King – obeying God perfectly. (1 Tim 6:15). In Ezra He is The Faithful Scribe – who leads us out of our captivity. (Ezra 4). In Nehemiah He is the Re-builder of the broken down walls in human lives. And in Esther He is Mordecai – who was exalted to the second seat of power, where He works for the welfare of God’s people. (Esth 10:2-3; Heb 1:3). “Esther” is actually her Persian name (which means “star”). Her Hebrew name is “Hadassah” (which means “myrtle”). It is interesting that her Persian name is used throughout this book. This is probably due to the time it was written (Persia/Medea ruled the world) – and also was a contributing factor to this book being left out of most Hebrew copies of the canon of Scripture. Another complaint regarding this book is it’s seeming lack of containing the name of God. Along with Ruth, the book of Esther has had a bad rap due to this unfortunate stigma. What most people do not realize is that – while true that in our English translation there is no mention of God – in the original Hebrew writing we see God’s Name secretly hidden in several passages – such as 1:20; 5:4; 5:13; and 7:7. In those verses – in the original Hebrew language – we see what is known as the Tetragrammaton “YHVH” (where we get the name “Yahweh”). For instance – Esther 5:4 is written like this in Hebrew: יבוא המלך והמן היום Each word begins with a letter from the Name of God – YHVH. The presence of the divine name in Esther (and also Psalm 96:11) has been known for a very, very long time. It is no secret bible code. Ancient Jewish scribes created notes in their manuscripts telling those who copied the text that it was okay to write the divine name in these two verses because it was part of the original text. It was a common scribal practice in the ancient world to use the first letters of a series of words, verses, or sentences to include some sort of information. Finally – what is the main purpose of the book of Esther? What is the main theme and message? As we have already previously discussed – it is highly probable that these events took place before Ezra/Nehemiah – during the time when the Israelites were in captivity for 70 years in Babylon. This situation – where Esther is used by God to save and preserve His chosen people – is the main point to this book. Since the beginning – Satan has been in a full on assault of God’s people. Satan is well aware of this prophetic promise from God recorded in the above verse. Because of this, he has been trying to eliminate the Jewish people throughout history. So far we have seen his attempts by using the Philistines, Edomites, Amorites, – and now Haman (a descendant of the Amalekites – whom God cursed in Ex 17:14-16). Even in modern times we have seen this same satanic plan acted out in the Holocaust. Although these tricks of Satan are not new… the main message of Esther is that God will preserve these people – as He promised over and over again to Abraham, David etc. In this book we see that God will even use people who do not know Him to help fulfill His promises. As with Cyrus – King Ahasuerus is simply a pawn in this game. God is faithful! 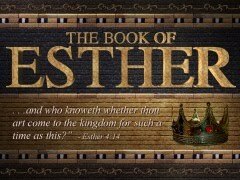 When did the events in Esther happen? Within the scholarly world there is much debate and disagreement as to the precise timing of the events recorded in the book of Esther. Without becoming too bogged down with minute details – yet in the spirit of providing good historical premise for you – let’s take a brief look at the two main lines of thought. The first group has the events of Esther taking place before the events we have just read in Ezra and Nehemiah. That is before Cyrus ever sets the Jews free and allows them to return to Jerusalem. This would place the timing sometime in the middle of the 70 years of captivity in Babylon. This group asserts that the King named in Esther was Darius the Mede (mentioned in Dan 5). This would date these events around 620 B.C. (ish). According to this perspective, Mordecai, the cousin to Esther, was taken into captivity with King Jehoiachin, and was the same Mordecai mentioned in Ezra 2:2 and Nehemiah 7:7 as part of the group of exiles who returned to Jerusalem some 59 years later with Ezra. Furthermore, this group believes it was Darius the Mede (Ahasuerus) who takes Esther as his wife – and she later gives birth to the infamous Cyrus who (now sympathetic to the Jewish cause from his mother) would set the exiles free. It is this view that was proclaimed in Jewish tradition by many of their Rabbis, and is adopted by Finnis Jennings Dake (among others) today. The opposing main view is that King Ahasuerus was actually King Xerxes – who reigned over the Perisan empire from 485-465 B.C. This would place the events of Esther about 35-40 years after the completion of the Temple and the walls in Jerusalem by Ezra/Nehemiah. This was the view supported by the 1st century Jewish historian Josephus, as well as the Septuagint – and many scholars today. The reason for the confusion is that historically, the Persian kings were known more by titles then by actual names. The meaning of the “Ahasuerus” in Esther is “Mighty King” and can be seen given to many of the kings who ruled over Persia during her lifetime. As well, the title “Artexerxes” means “Great King” and was used by 4 other Persian kings through history. 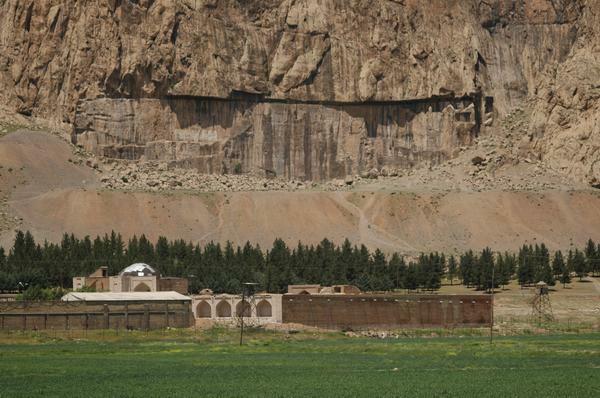 To make matters even more confusing, there is a giant rock cleft rising about 1700 ft out of the desert floor on the road east of the ancient ruins of Babylon called the Rock of Behistun – and in 1846 it was finally deciphered as a list of the ancient line of the kings of Persia. Yet, another list found on what is known as the Cylinder of Cyrus only agrees with a portion of those listed on Behistun. So even the few archeological records in existence do not agree… the reason being that each engraving was subjected to the whim of the king who made them. What we can be sure of is that whenever the events of Esther took place – they were monumental in the history of God’s people and just another example of amazing grace. As we shall see through this short book, God (once again) steps in and intervenes to ensure the line of David is preserved – just as He promised Abraham it would be. God is always faithful to His promises… even today.